Buyers of wood flooring often pay great attention to the decorative side of the wood when evaluating wood flooring for their project. This often consists of looking at the finish, species of wood and grade, however practical implications sometimes play second fiddle. In this article we will look at types of wood flooring construction and their suitability around your commercial or residential property. There are two types that are considered ‘real wood flooring’ meaning that the flooring boards are made entirely or incorporate hardwood. The first is called solid wood flooring as it is made from 100% real hardwood, while an alternative is called engineered wood flooring as its construction contains real wood together with MDF, Plywood and Softwood. When fitted correctly you will never be able to spot the difference meaning that the visual side is set aside for a moment in favor of the practical pros and cons of each type. These are easier to explain based on the location of the floor in the property. Living Room and Bedrooms – Either type will suit such areas well with one significant exception. If the room benefits from under floor heating, solid wood flooring will damage as a result of temperature changes. Only an engineered board can withstand such challenging conditions for wood. If under floor heating does not play a part, solid wood flooring is recommended, as service life will exceed that of engineered. 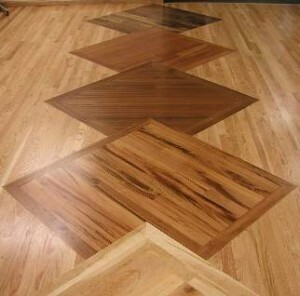 Kitchen – Wood flooring was never considered suitable in the kitchen. The presence of humid and wet conditions often caused accelerated damage to solid wood floor (which was the only option up to a few years ago). When solid wood flooring is fitted, an expansion gap is maintained at the perimeter of the room. This is crucial to allow the natural construction of solid wood to contract and expand due to atmospheric conditions. Therefore fitting solid wood in the kitchen can cause moisture and damp to make their way to the boards. An engineered board also requires an expansion gap though smaller, meaning that with the correct type of waterproof finish it is certainly suitable in the kitchen. You would be wise to care and pay extra attention in the up keeping of the wood in such environment. Bathroom, Basement and Conservatory – Perhaps the most challenging conditions for wood are those that exist in the mentioned areas. These often consist of varied atmospheric conditions as a result of humidity in the air. High humidity causes natural wood to expand and low humidity causes wood to contract. It means that a solid board will never stop aggressively contracting and expanding, until finally it will warp and bow thereby leaving you with one option to replace the floor. An engineered board with a UV Lacquered finish is the only recommended option for wood flooring in the bathroom, basement and even in certain conservatories. Unlike traditional coatings that penetrate the wood, the UV Lacquered remains on the surface thereby sealing the wood. Floating Method – Floating depends on the weight of each board to support the other. While it is the most affordable and quickest method, heavy boards are unsuitable, as the structure will not stay in place for long. Only engineered wood flooring should really be fitted in such manner. Nail, Glue and Staple Down Method – These methods are suitable for either type, but highly recommended in the case of solid wood flooring. Glue is the most popular option. It will allow a solid board to expand and contract (which it needs), while in the case of engineered board fitted over under floor heating it will prevent the creation of air pockets. Nail down and staple down are also good alternatives. Article written by Ryan Ash of Wood and Beyond. London based vendor of white wood flooring from solid and engineered construction. Hardwood flooring in the living areas and bedrooms provide multiple benefits to home owners. Not only can you customize the type of wood and finish of the hardwood flooring to match the rest of the house’s decor, but hardwood floors are easy to maintain. A sweep with a dry dust cloth or a quick vacuum helps keep wood floors clean and dust free. nice post.thanks for sharing.i like it.